This is part two of a five-part series on energy and Thriving as an Empath. Did you miss any of the blogs? In the second installment of Thriving as an Empath, I will illustrate what an empath is, how they read energy and common patterns they can develop through the unconscious use of their skills. Being an empath is both beautiful and confusing. I have encountered many who are suffering because they lack the education necessary to keep themselves emotionally and physically healthy. 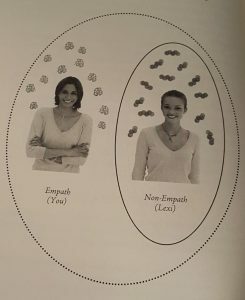 Over the last 10 years, there has been a shift towards greater awareness of what an empath is and how to help them move out of victimhood. But it is still far from mainstream culture. What is important to me is helping individuals who are struggling with these gifts and patterns find grounding and peace. There are many different types of empaths; physical, emotional, animal, nature, electronic, etc. I have found a lot of descriptions but no definitions I felt universal enough to cover all types. I define an empath is anyone who senses and reacts to the electromagnetic energy waves coming off of people, animals, plants or objects. How you sense and react to the energy is your personal expression of being an empath. For instance, my niece is an animal empath, she interprets the emotional energy of animals. While on vacation a few years ago, she became very upset because she could feel their dog at home and how anxious and upset he was being left alone for a week. Empaths often are able to read several kinds of energy (person, animal, plant, etc) but ultimately there are two primary types of empaths. The first is an emotional empath, those people who interpret the energy of humans, dogs and plant life through their emotions. The second type is the physical empath, they interpret the energy through their physical senses. For example, a physical empath feels the pain of your headache and not the sadness of your heartbreak. From the time we are in utero through our first 7 years of life, we share an energy field with our mother. We experience the world through this merged field. This enables the mother bond and allows mom to understand baby’s needs. It also enables baby’s rapid learning of emotions, expression, motor skills, and cognitive skills. This really means that we are all born as empaths. Some people grow out of this stage of development and others retain the ability to merge energy with others for the rest of their lives. For those who have retained the ability to merge past the age of 7, they will continue to improve their skills as they mature. Empaths are astute when interacting with people. They will pick up on body language, word choice/avoidance, tone of voice, and logic used by the other person. Throughout their lives, empaths become attuned to other people’s emotional states. They sense the true emotions underneath what is actually being expressed by someone’s words or facial expressions. Empaths can read the energy of family and friends who may physically be at a distance. This behavior is natural for the empath. They are not consciously trying to read energy. For empaths, reading energy is just like reading street signs and for the same reason. Empaths are looking for direction within the relationship, situation, or conversation. There does seem to be a shift with the younger generations of empaths being better adjusted with their skills on the whole. I believe this is partly evolution and partly because there is more acceptance and awareness of the world of energy. Adult empaths over the age of 30 though, tend to have a harder struggle with their empath-ness as most of us didn’t know we were empaths for a long time. If we had strange experiences as kids and talked to adults about it, we were probably told “it was all in our heads” or “we don’t ever talk about that, it isn’t appropriate.” So we stuffed our feelings down (both our own feelings and the feelings we picked up from others) and tried to numb ourselves any way we could. Numbing behavior creates a myriad of addictions depending on your personal preference and comfort with risk. My numbing tools of choice are food and television. But many drug addicts and alcoholics are actually empaths who don’t have the understanding or skills to manage the energy they are absorbing all day. So what are the gifts or skills of an empath? The psychic gift of sensing feelings both emotional and physical. In an empath, it means psychically sensing the mood, emotions or physical pains of a person, place or animal. It is from this sense that empaths merge energy. The ability to merge freely and easily has two components, one is clairsentience and the other is poor energetic boundaries, I will talk more about boundaries in the next section. The psychic gift of just knowing things. In an empath, claircognizance means psychically interpreting their environment through energy. They feel the energy in their field and then use body language, word choice, and tone of voice to decipher the information. This sense is how empaths read the message in the emotion or physical sensation. For instance, if I feel the emotion of sadness through the merging of energy, it is from claircognizance that I will understand the person is lonely. If someone is experiencing a sharp pain in their shoulder, claircognizance is how I understand that there is a pinched nerve. Empaths naturally run the energy they are in and everyone in their presence will benefit. Running energy means they are moving, clearing and flushing the energy within their environment to clear out heavy, dense or negative energy. Often empaths find that people feel comfortable around them and open up to them, even complete strangers. Energy healing puts others at ease and offers a temporary relief from their own chaotic energy. This is particularly true for high strung, anxious, or troubled people. Empaths are natural healers. They have a genuine desire to help others, sometimes at their own expense. And they usually have energy healing skills, even without any training. Empaths learn to tend to the needs of the people around them because empaths only feel at peace when everyone around them is happy or calm. They feel responsible for keeping the peace. Their heightened sensitivity to other people’s feelings creates a pattern of focusing on other people’s needs and desires to the exclusion of their own. They often feel doing things for themselves is selfish instead of self-care. This can look like placing their needs secondary to the needs of others. Or it could be sharing extremely personal stories with new acquaintances. And even holding too much responsibility for someone else, codependence. Boundaries are both energetic and behavioral. When we merge with someone it is our permeable energy boundary that allows the swift merging of energy. In our relationships, boundaries look different. Deciding what behavior you will tolerate from someone and what behavior you won’t tolerate, is having boundaries. An emotionally healthy person has strong boundaries. Strong boundaries depend on your ability to tolerate conflict and speak up for yourself, two things that empaths generally don’t like. Remember, empaths feel the other person’s feelings too. They aren’t keen on creating an opportunity for someone else to be angry or hurt. It is hard enough dealing with those emotions in others, but knowing they were the cause is very upsetting. Being aware of other people’s unexpressed emotions is difficult. At first, it feels like chaos, the empath doesn’t understand what they are picking up on, it just feels noisy, confusing, and physically uncomfortable. This is what I call energetic cognitive dissonance. It is created when the words, actions, and facial expressions someone is using do not match the true emotions the person is experiencing. As empaths mature and they begin to figure out what is happening, it becomes even more challenging. How do you react? Do you say something? Do you inquire about this thing you picked up on? Do you ignore it and pretend you don’t know what is going on? Knowing more than you need to, or understanding more than the other person meant to communicate to you, is a little scary and makes for uneasy conversations. Empaths need time alone each day to recharge their energy stores because being out in the world causes sensory overload. The desire to be alone can also stem from social awkwardness as well. Often empaths are sensitive to sound, light, and crowds. Empaths are vulnerable to conditions such as chronic fatigue syndrome, adrenal fatigue, headaches, anxiety, depression, digestive issues and hormone imbalance to name a few common ones. 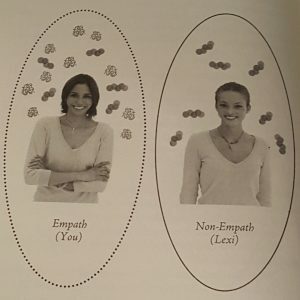 Empaths become ill by one or both of the following, constant people pleasing leading to the complete lack of self-care, or illnesses caused by an inability to process the amount of energy being picked up from others and stored the body or energy field. In order to combat the first way they get sick, empaths must be aware that they are more sensitive than non-empaths to exhaustion and overload. Proper self-care is crucial to maintaining optimal energy levels and strength. Diseases caused by an inability to process the amount of energy being collected in the body and field. My healer, Linda Kardos, explained to me that empaths are the energetic toxic waste dumps of the universe. Why? Because 1. we want to heal everyone and 2. we know ourselves to be healers (even if this knowledge is unconscious). Therefore we absorb and collect energy in the desire to transform and heal it. However, if we have not yet learned how to manage our energy and we don’t know the tools to keep ourselves clear of debris, we end up making ourselves sick. I hope this has helped those who are empaths understand themselves better and those who may know or parent empaths, to become better armed with information to help them. Unaware empaths, and even aware empaths, who have not begun to learn how to manage their energy and gifts, are in a lot of pain, physically and emotionally. Because of the patterns they have developed, they can feel like a victim of this ability. With education and some great energy tools, empaths can become healthy and happy. And if you do recognize these traits in your child, I encourage you to start talking to them about it now. Knowledge is power and it is important to help them feel less confused and isolated. In the next installment A Primer for Energy Maintenance, I will talk about energy; the chakra system, boundaries, and how unaware empaths use their energy vs. how aware and educated empaths use their energy. Thriving as an Empath is a blog series. 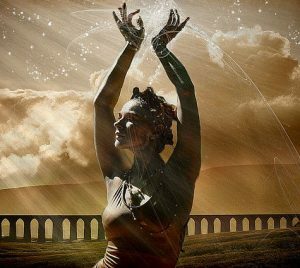 If you are ready to begin the journey to becoming an Empowered Empath, download the Four Practices for Claiming Your Empath Power. Laura Rowe is a spiritual teacher, intuitive energy practitioner, and mentor. Living in Portland, Oregon, Laura founded The Vital Spirit, an entity that seeks to be an instrument in the ongoing shift in human consciousness. Laura assists empaths and lightworkers to thrive not just survive. The Vital Spirit works with empaths to clear energetic blocks, release limiting beliefs, thrive in business/careers and navigate interpersonal relationships.